Offline Conversions is the new outstanding capability of Facebook Ads which let you push back conversions to Facebook with the goal of better tracking conversions and better calculate ROI. 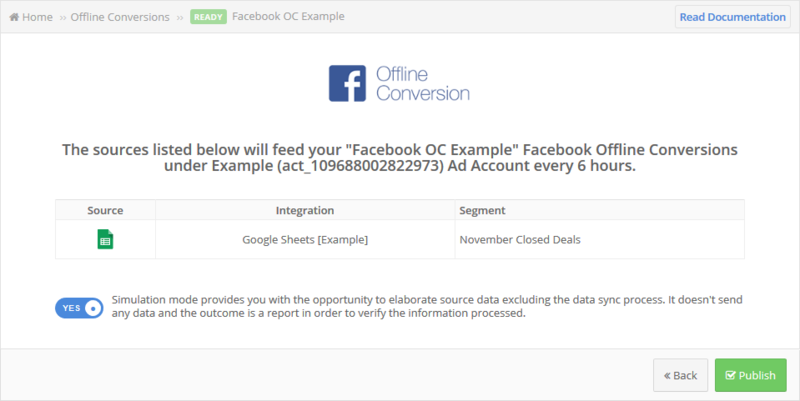 In this guide, you will see how to integrate Facebook Offline Conversions (formerly called Offline Events in your Ads Manager) with your CRM. Your CRM must be included in our integration list. If it’s not, please get in touch here. Your CRM must have a signal of converted leads. Something which state a contact is a paid customer. 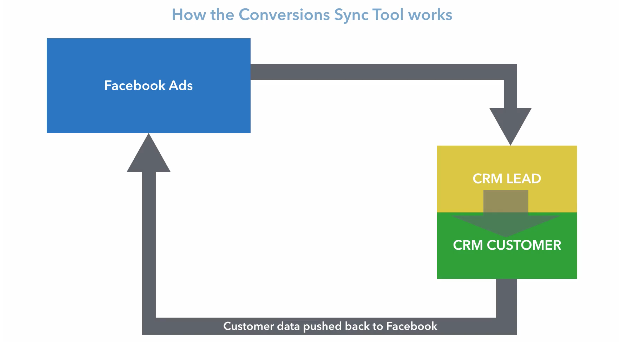 Below a simple infographic on how the Offline Conversions Sync tool operates in collaboration with your CRM. 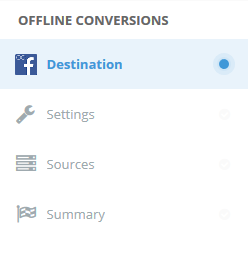 Head over to the left sidebar and click on Facebook Suite > Offline Conversions. You’ll see the steps on the left side of the screen during the bridge creation process. In the first step, you should select the Ad Account and the Business Manager you’d like to assign the Conversion from the drop-down. If you didn’t add the Ad Account already, you may click on the “Add Ad Account” button. Pick an existing Custom Conversion or choose to create a new one from the drop-down. In case of a new one, enter the name that will be visible inside your Business Manager. You may add some labels to organize and identify your bridge later in LeadsBridge. Here you can choose if you want to create an integration from scratch or select an existing one, already created in your LeadsBridge account. Click Browse… and select the source of your contacts from the list. You may filter source applications using group tags on the selection panel. If you choose to create a new integration, enter the information requested to authorize the account. Each configuration depend on the setup properties of the desired source application. Select the segment you’d like to use as the source for your contacts. In this example, we should choose a spreadsheet from our Google Sheet account. Add conditions to filter contacts and tailor specific segments. Remember that source data will be processed only when all conditions added are met. Here is where the magic happens. This is the place where you match the information between the source and the Conversion fields. Map as many fields as possible to achieve higher performing data matching to people. You’ll see a field name with the destination integration’s logo at the top, this indicates the name of the field on the Offline Conversion. Underneath there’s a box where you may add the information you’d like to send. Please remember to specify these mandatory fields to create the Event Set. It’s also possible to add further fields from the ones available for the destination platform. Here you can manage your Audience sources, for example you may add another source to combine different sources into your Offline Conversion. This is the recap screen before publishing the bridge, where you may choose also if you’d like to run a Simulation first. Simulation mode provides you with the opportunity to test the sync process, to elaborate source data, without sending any information to Facebook. The outcome is the CSV report in order to verify the information processed. Once you’re ready, click Publish to start the syncing process. 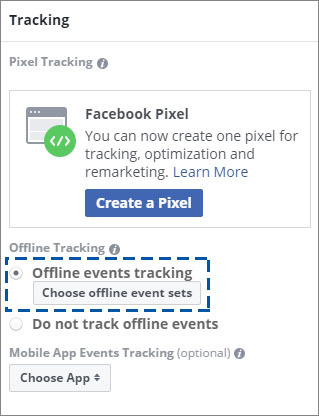 The final step would be edit, or assign the Offline Events Set to your campaigns in your Facebook Ads Manager. Please note: the Offline Conversions are available from the Guru plan. Please, feel free to reach out if something is not 100% clear, you can contact us and will be a pleasure to jump on a call and configure it with you.